Thunderstorms can happen unexpectedly. They may be beautiful to watch, but they can be treacherous to drive in. And if you don't know what to do, they can be frightening. The sudden clap of thunder may stun you. But the real threat is the potential lightning that follows thunder. There are a few safety precautions you should take if you find yourself out in a storm. 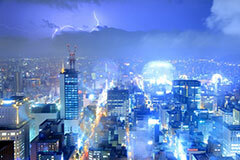 Find out what you should do if you are caught in a thunderstorm. Thunderstorms may be exhilarating if you are watching it from the safety of your own home. But these tips can help you drive safely until you get there. What's the safest way to get through a thunderstorm? Not drive at all. But if you find yourself on the road when a thunderstorm hits, don't panic. Simply pull over to the side of the road and wait the storm out. Contrary to popular belief, your vehicle's rubber tires won't prevent lightning from striking your car. But that doesn't mean you should get out of your vehicle. Instead, roll up your windows and try to wait until it passes. Why is your car safer than being out in the open? If the worse should happen and your vehicle is hit by lightning, your metal car will conduct the current safely through the frame and into the ground. This only works, however, with hard-topped cars. Open or soft-topped cars such as convertibles or Jeeps won't provide the same amount of protection, assuming that the lightning hits the top of the car. So if you want to take your open-top car out for a spin, it may be a good idea to check the weather reports first. First, thunderstorms may bring a torrent of rain. And that, in turn, reduces visibility. These types of driving conditions can be dangerous. If you can, pull off the road and seek shelter. Most thunderstorms only last 30 minutes, so you won't need to wait long. But if you do pull your car over, don't forget to employ your emergency brakes and hazard lights. Sometimes you may encounter a thunderstorm with no shelter in sight. If you can't wait out the storm somewhere else, the next best place is to wait in your car. So if you must stay on the road, pull over onto a shoulder and turn off your engine. Remember to also use your emergency brakes and turn on your hazard lights. Next, if you are waiting out the storm in your car, it's important that you don't touch anything metallic. This may include the steering wheel, radio, car chargers, and door handles. Keeping away from metal objects is a way to protect yourself just in case lightning strikes the vehicle. Visibility may be low if the storm brings heavy rains. To help yourself be seen by other drivers, make sure to turn your car lights on. Sometimes you can't predict when a thunderstorm may hit. And if you're already out on the road, you may have few options about pulling over to safety. So if you have to wait out the storm in your car, make sure that the windows are up. Also, it's a good idea to keep away from any metal objects while you're waiting in your car. It may be an inconvenience, but it is a safety measure just in case your vehicle is hit by lightning.